I was planning on buying the carbon Dan Moto exhaust and have heard a lot of good things about it, seen videos, etc. When I went to their site, though, I saw this exhaust. I've tried to Google it, but I can't find any reviews or videos or anything. Does anyone know anything about this pipe, or have any guesses? Their carbon GP pipe is a little bit cheaper, and the videos of it online are pretty good. I think Z did a big review on 600rr about another of their pipes and he had good things to say. 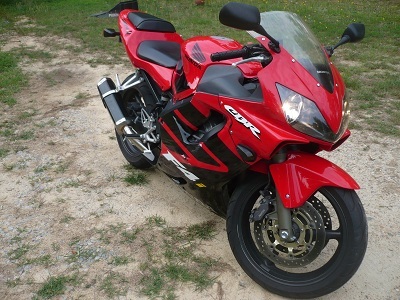 I think I'd like the look of this one a little better, but I haven't found any photos of it on bikes anywhere. I emailed them and asked if they knew of any reviews for it. I emailed them over the weekend, and they got back to me early this morning. I ordered one of these for my 2001 F4 I. When it comes to slip on exhaust there is not a whole lot to them or going on with them. Try taking one apart some time, it is rather dissapointing experience once you break one down. As long as it is made well, and you like how it sounds you should be good to go. I look forward to hearing it Stu. Mine won't be hooked up for a while. 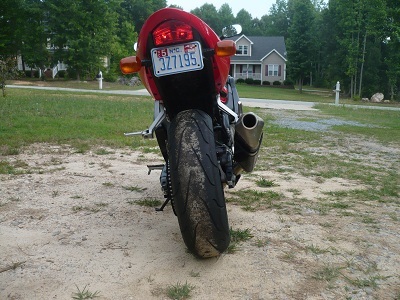 Interesting that you got your exhaust so quickly; mine took several weeks. Alright everyone that is interested. I got the exhaust and put it on the day I got it. I would have posted pictures and video ealier, but I wanted to have the chance to burn it in a bit before I sent a video, and I wanted to have it on and ride around with it on to make sure I liked it and that it would stay on. I have had a few people check it out and say that they want one. 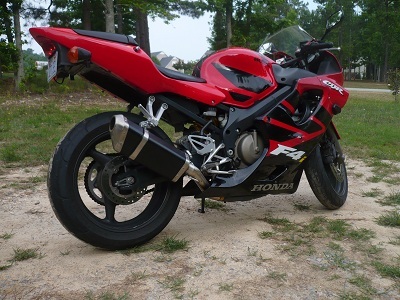 You really cannot go wrong here for the money, and to be honest slip on exhaust is so low tech anyway, it is impossible (not logical) to justify $400. If you take a look at some of the other threads on this forum you will see that when people cut down their exhaust the inside of the muffler or can is not that amazing. I remember cutting down mufflers for my uncle's drag bike way back when. People you are dealing with a perforated pipe, steel wool, and fiberglass inside of these mufflers. designed especially for your machine is the midpipe. 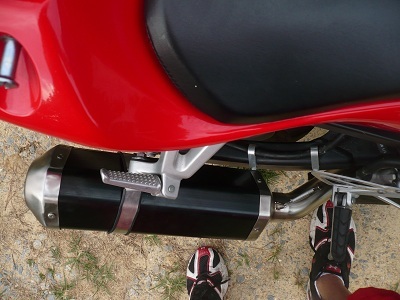 Other than the midpipe nothing is really special for your bike. Do not be fooled. The most imortant thing is if the matierials used are quality. You do not want to buy something that is going to come apart. What I have done here is attach some photos of it to give you an idea of what it looks like on my machine, I will post a video next. Let me know if you have questions.